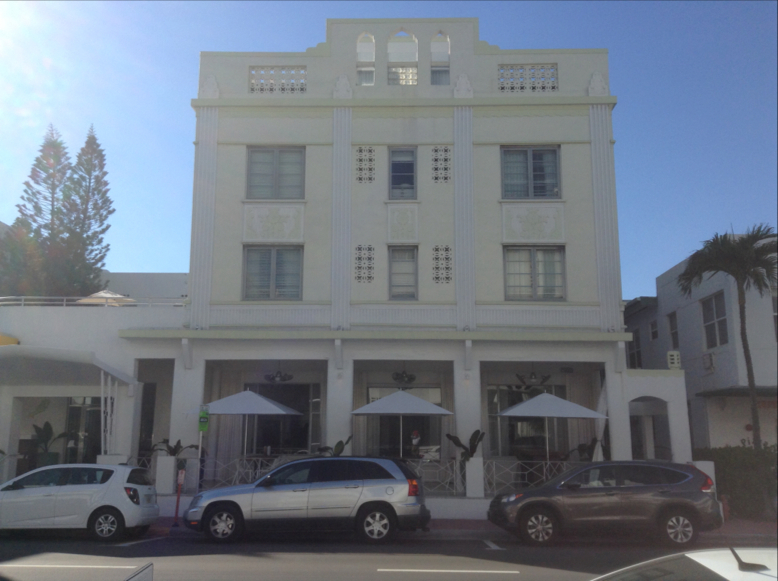 The following are highlights of my recent visit to the historic Art Deco district in Miami Beach, Florida, also known as South Beach. Photos are organized into two sections: Terrazzo and Architecture. Geometric overlay with inlaid lettering. 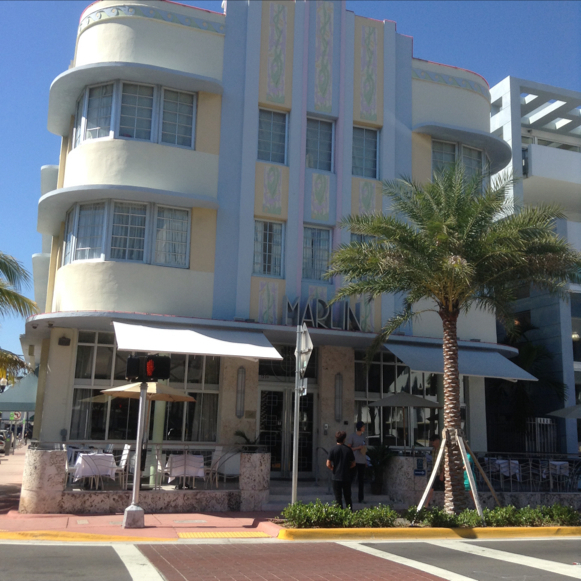 The Marlin Hotel is a typical Miami Beach Art Deco gem. Smallish in size, it features a “Rule of Three” Deco façade with ornamental relief work depicting sub-aquatic marine life. The ornamental friezes are painted in “Tropical Deco” pastel colors. 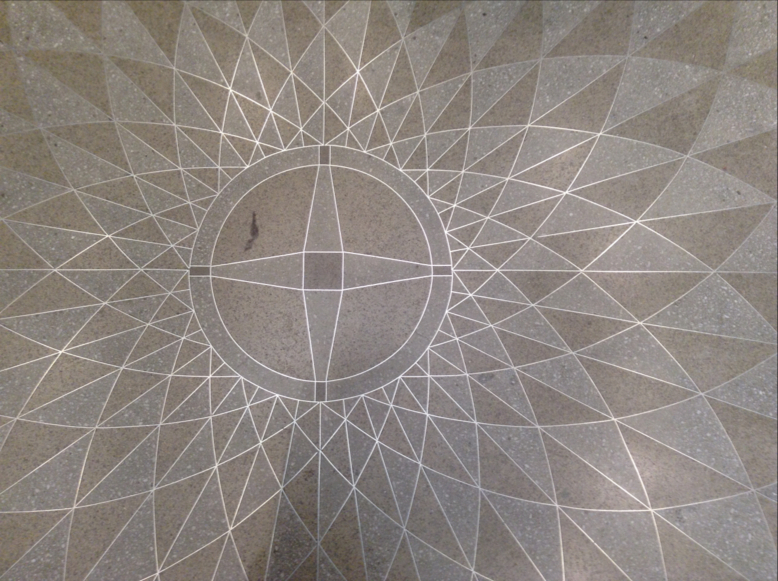 There is geometrically-patterned terrazzo flooring both in and outside. The corners of the building are rounded in “Streamline” style. Concrete “eyebrows” projected over windows provide shade. The perimeter of the façade is framed in blue neon lighting–very striking at night. Another exquisite railing with nautical themes. The vacant Greystone Hotel was recently sold for $7.5 million. This recent visit was a delicious appetizer. I now have some questions that seek answers. 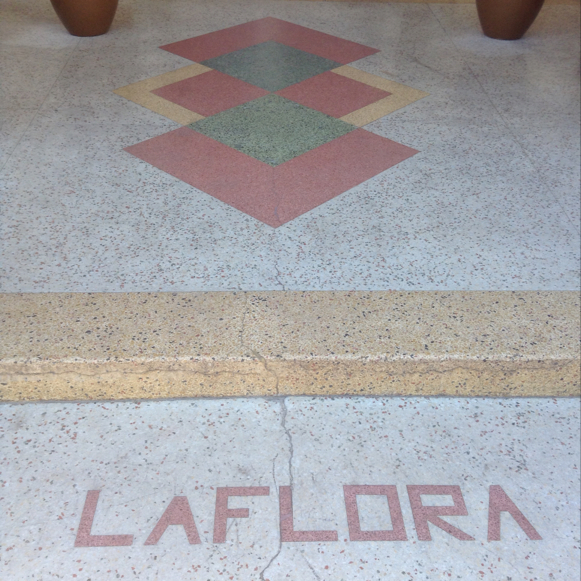 Who were the artisans who installed these acres of colorful, decorative terrazzo? (We are kindred spirits.) Where did they come from? Italy? The Caribbean? (I myself, for example, learned to do terrazzo in Puerto Rico.) 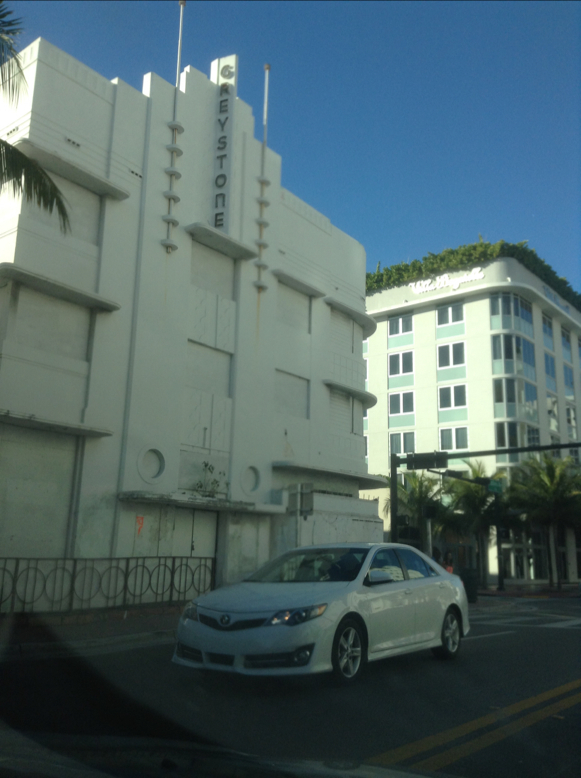 Was there some cross pollination between the Art Deco architecture in nearby Havana, Cuba and Miami Beach? This does seem apparent to me. I will be exploring all this in the future. I look forward to my next visit to this exciting tropical locale. I passed through Miami Beach in 1976 on my way to a 7-month trip through Central America. I had no particular interest in terrazzo until 1978. All I remember of Miami Beach was lots of aged retirees, many of whom were Jewish New Yorkers. The area looked somewhat bedraggled. 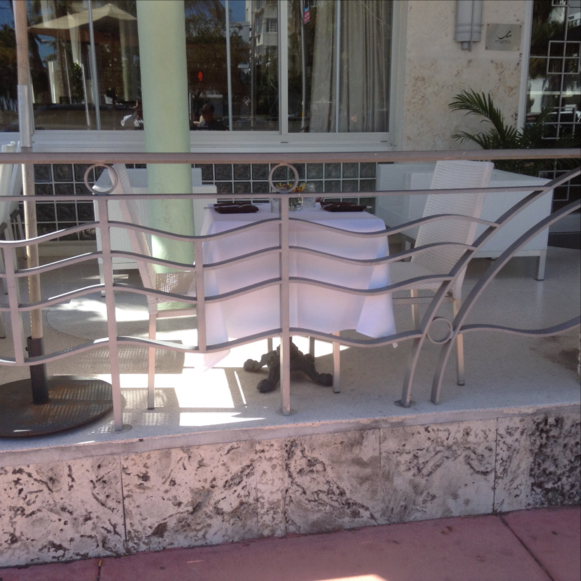 Years later, I became aware of the Miami Beach Art Deco District and the important part that terrazzo played in it. I designed and cast the Crescent Table in 1988 as my homage to this Tropical Art Deco. For this piece I employed a derivative tropical pastel color palette. Fast forward to February 2015. 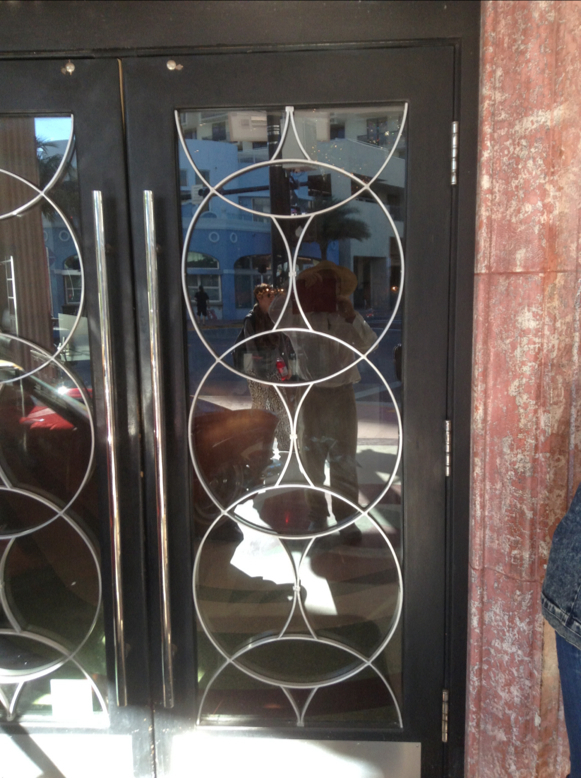 On a recent trip to Florida, my wife and I did a detour to Miami Beach to see the historic Art Deco district and to look for terrazzo in particular. We didn’t have to look hard. Terrazzo was everywhere, both inside and outside buildings, and replete with ornamental design. It was all quite exciting. The Art Deco style buildings, many designed as hotels, had been restored and looked great. I ran from place to place, feeling mildly ecstatic, and took pictures. Many buildings were surprisingly small by today’s standards and were human scale. They were like so many gems, each perfect in their own unique design. We located the Miami Design Preservation League, an outfit that is largely responsible for the preservation and restoration of this unique national treasure. They had books on the architectural history of Miami Beach. Looking through their indices, I saw no listings under terrazzo whatsoever. This is an egregious omission, in my opinion, and fairly typical as far as architectural books go. Similarly, in my research for this article, there was a dearth of online information about the ubiquitous decorative terrazzo in this historic district. We terrazzo people are largely undocumented, and I’m not talking about immigration. 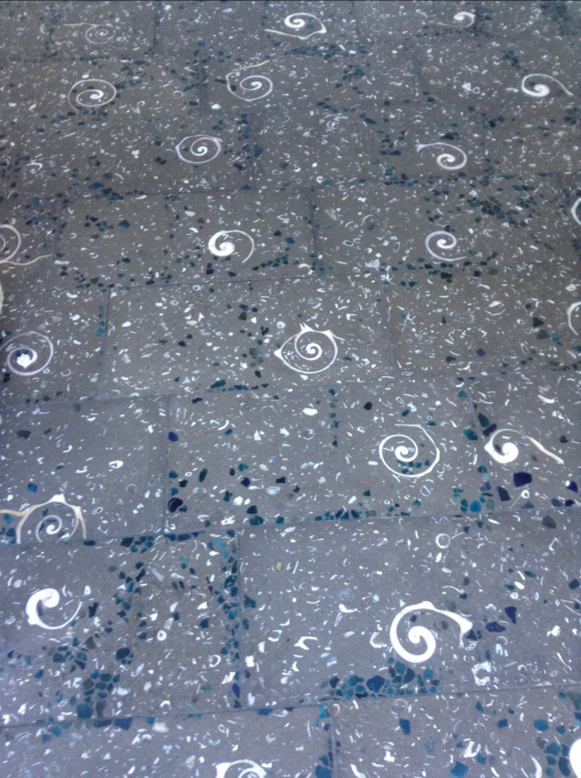 The purpose of this blog is to start to tell some of these terrazzo backstories, including my own. Speaking of backstories, I think it’s time for a bit of history on Miami Beach and the historic Art Deco area, sometimes called South Beach. The most prominent character in the history of Miami Beach was the flamboyant Carl Fisher. Fisher became a millionaire from creating the first bright automobile headlights. He also created the Indianapolis Motor Speedway. On a trip to Florida in 1913, Fisher came across the barrier island of Miami Beach, which was then an undeveloped mangrove swamp. He envisioned a vacation destination for rich Northeners, along the lines of New Jersey’s Atlantic City. He provided the money to finish the bridge started by John Collins, that would connect it to the city of Miami. In its day, it was the longest wooden bridge in the world. In exchange, he received some of the real estate that Collins owned. Fisher physically created Miami Beach. He cut down the vegetation, dredged up sand, and dumped it down to create flat acreage and additional acreage as landfill. He brought in topsoil from the Everglades and replanted this new environment. Carl Fisher was quite clever at promoting his holdings, and soon Miami Beach was the place to go. Affluent Americans came and built fabulous homes on his land. All this promotion helped contribute to the Florida land boom of the mid 1920s, which featured a lot of speculation and unscrupulous practices by hucksters. Fisher made money, but in 1926, a hurricane leveled everything and shook his finances . With the crash of 1929, Fisher began to fade from view. Around this time, many people moved to Miami Beach, including a robust population of Jews. Due to restrictive covenants, Jews were not permitted to live north of South Beach. Many of them started building small hotels in South Beach, and chose the Art Deco style, which was very popular at that time. The most prolific architects building in this idiom were Henry Hohauser and L. Murray Dickson. They used hurricane-proof materials such as concrete block, stucco, concrete and glass block. Hundreds of these structures were built. By the 1970s these Deco buildings were aging and some buildings of historic value were being knocked down. A preservation effort was led by Barbara Capitman, and the Miami Design Preservation League was formed. The Art Deco district was put on the National Register of Historic Places, and this led to the preservation and restoration of this architecturally significant area. Today there are 960 Art Deco buildings in this district. It is one of the areas with the most Art Deco buildings in the world, rivalled only by the elegant Art Deco apartment buildings on the Grand Concourse in the Bronx, New York City, very near where I grew up. 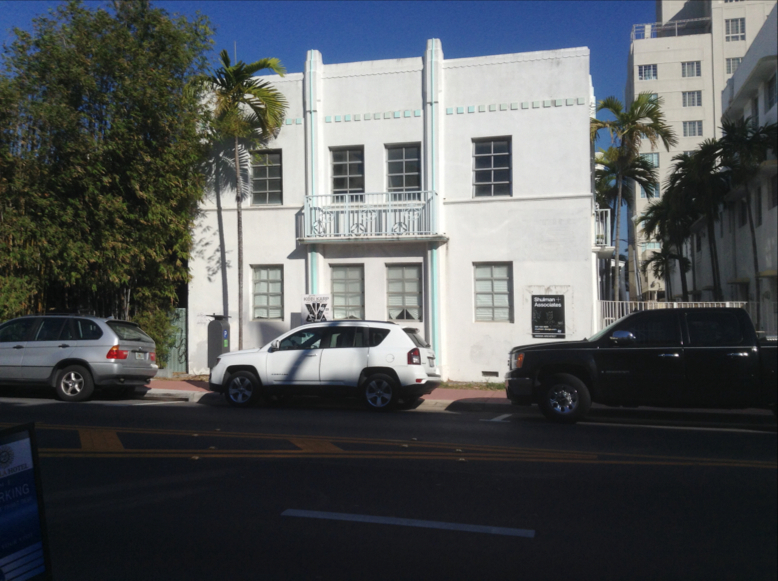 What characterizes Miami Beach’s Tropical Art Deco architecture? These are masonry structures devised to resist tropical storms. Typically, there is the “Rule of Three”—a strong central element, flanked on either side by two similar structures. This creates a pleasing geometry. The buildings have what is sometimes called “the wedding cake” look. This includes the “icing” in the form of decorative relief friezes, usually made of stucco on the exterior. Glass block is a another distinctive element, as is the use of neon lights, which create a colorful and magical nightscape. Tropical pastel colors are used, such as flamingo pink, seafoam green and turquoise, the color of the Caribbean Sea. In theory, these light colors were used to reflect some of the tropical heat. Another passive cooling element in these pre-air conditioning days were the “eyebrows” or concrete projections above windows that provided shade. Perforated decorative concrete block was used for ventilation as well. Also typical is the abundant use of colorful terrazzo flooring, often featuring bold geometric designs, both inside the buildings, as well as outside on their entry porches. The address or the name of the building may also be inlaid in the terrazzo. Another strong theme is the “nautical” element. This is a seaside community, so the reference seems obvious. However, some of the most elegant Art Deco designs of the time were on the interiors of the luxurious trans-Atlantic ocean liners and reappear in the architecture. Porthole elements are common, and ornate metal railings evoke the ship’s railings. Many of these buildings are just a few stories, so that elevators would not be a necessity. Stay tuned for my next blog featuring a South Beach Art Deco tour, which is divided into two sections—Terrazzo and Architecture.